Pink Castle Blog: Golden Tickets are Back! Win a Janome Hello Kitty Sewing Machine! Golden Tickets are Back! Win a Janome Hello Kitty Sewing Machine! I'VE GOT A GOLDEN TICKET! Well, technically I have a few hundred Golden Tickets. BUT, I'm here to give them all to you! Pink Castle Fabrics' Golden Ticket promotion is back! This time we are giving away a sewing machine! Not just ANY sewing machine, a SUPER CUTE sewing machine! A Janome 15822 Hello Kitty machine! (click here for the specs!) Now until supplies last, every $50 you spend in one order gets you a Golden Ticket! Get over to Pink Castle Fabrics now for your chance to win! EVERY GOLDEN TICKET IS A WINNER! 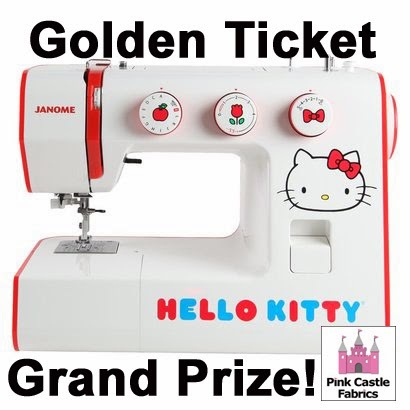 You will win a Gift Certificate for Pink Castle Fabrics in one of these amounts: $5, $10, $25, $50, $100 or the Grand Prize of the Hello Kitty Janome! 1. Golden Tickets are only good on orders after February 6th 2014 and until supplies last (over 550 prizes available). We cannot issue Golden Tickets for orders placed before February 6th, 2014. 2. One Golden Ticket is issued for every $50 spent (before shipping) in one order. For example, if you order $134 you will get 2 tickets. If you have two orders of $25 you get no tickets. Monthly Club subscriptions do not count for the Golden Ticket contest. This is only for orders placed online at http://PinkCastleFabrics.com or at our in store location in Ann Arbor, MI. 3. To find out the amount of your gift certificate, input the coupon code on the Golden Ticket at checkout on your next order. Don't forget, every ticket is a winner! Your prize could be $5-$100 off your next order! The Grand Prize ticket will say "Grand Prize" and have information on how to claim your prize. 4. All Golden tickets will expire March 31st, 2014. There are at least 3 $100 Gift Certificates and 6 $50 Gift Certificates available as well as the one Grand Prize.